If you're at the point in your life where you've had enough of being unhappy with your body and have finally decided to take control of the situation, you're in a great position to start off... Learn more. The first step towards your goal is to figure out your calorie intake. Be sure you&apos;re getting enough of protein, carbs, fat, calcium, and fiber. Resistance training is essential for finding success in your goals. If you&apos;re at the point in your life where you&apos;ve had enough of being unhappy with your body and have finally decided to take control of the situation, you&apos;re in a great position to start off on the right foot - by learning the essential principles of fat loss for those over 40. Some individuals feel quite intimidated aiming for fat loss at an older age, wondering if they&apos;re too old to make significant changes to their body or if it&apos;s even worth it - would they ever look as good as they&apos;d like? Look As Good As You&apos;d Like? This isn&apos;t the case at all. 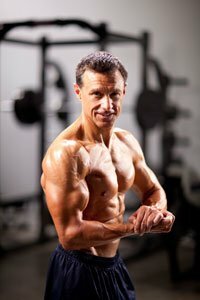 If you need proof, check out some of the senior bodybuilder&apos;s or fitness competitors who are competing and look absolutely fantastic. While you may be slightly older, this does not mean your body will not respond to a proper training program and fat loss diet. In fact, by taking action now, you will be doing so much for your future as far as maintaining healthy bones, muscles, and range of motion is concerned. If you neglected to get back into shape at this point, as you hit your 50&apos;s and 60&apos;s, you&apos;ll find you rapidly start to lose your range of motion, much faster than if you get active now. Sid Hanson Learned The Proper Way To Diet And Exercise And Shed 99 Pounds! Sid was tired of being overweight, so after many years for unsuccessful fad diets, he finally decided to get in shape the healthy way. Read on to learn how he lost 99 pounds right here! All of this said, there are some import things to keep in mind as you design your plan for maximal fat loss. Here are the main things to know. The first thing you must take into consideration when the goal is fat loss as an older adult is your total calorie intake. Since you may have already lost a small amount of muscle mass, your metabolism could be running slightly slower than normal. This just means you&apos;ll need to adjust your calories slightly downward for the time being until the metabolic rate is back up again and you&apos;re able to consume more calories. A good starting place is about 12 calories per pound of bodyweight a day. Eat at this intake for a few weeks and see what type of results you experience. If you&apos;re not losing weight, move it down by about 10-15%. If you are getting good results, maintain that intake, or if you&apos;re losing too quickly (say more than 2 pounds a week), bump it up by about 10-15% to slow the rate of weight loss down. If you are a very active individual already (you have an active job for example), you may find that this intake is simply not enough, so then you&apos;ll have to go higher even yet. The important thing is counting calories for a two to three week period and then adjusting based on real world results. Moving on to the specific nutrients that make up your diet, older adults may want to boost protein intake slightly more than someone who is a bit younger. The reason for this being that will help to boost the metabolism just a bit more, improving your results. Intake Slightly More Younger People. Also, this higher level of protein will prevent any further muscle mass loss from occurring, safeguarding you against this. Take in at least 1.2 grams of protein per pound a day, if not slightly more. Get this from lean sources such as chicken, fish, egg whites, lean red meat, and low-fat dairy products. After you&apos;ve figured out your calorie, protein, carb, and fat intake, then there are a few additional nutrients to look out for. The first one is calcium. Many older adults stop consuming as many dairy products in their diet, which will really come back to get them down the road. Since you&apos;re going to be at an increased risk of osteoporosis as you age, supplying enough calcium through your diet will help to prevent this and keep your bones protected. [ Click here to learn more. ] Bodybuilding Can Help You Prevent Osteoporosis! Right now you are picturing blue-haired, frail, little women who are hunched over. That&apos;s the telltale sign of osteoporosis right? It affects older white women with small bones only. Wrong. Learn more. Dietary fiber is another nutrient you&apos;ll want to be sure you&apos;re getting enough of. This will help to keep the digestive system regulated, promoting regular bowel movements, as well as help to prevent digestive related disorders and cancer as you grow older. Since fruit and vegetable consumption sometimes declines, your current dietary fiber intake could be lacking. Pay attention to this and try and get more fiber in whenever possible. Your Current Fiber Intake Could Be Lacking. Keep Eating Your Fruits And Vegetables. Finally, you may want to pay a bit more attention to your sodium intake than you typically do, particularly if you&apos;re suffering from high blood pressure. If you commonly eat convenience types of foods, there&apos;s a very good chance you&apos;re currently getting too much sodium in your diet, so taking steps to reduce this will be important. Again, increasing your fruit and vegetable intake will help with this, as well as supply you plenty of potassium which is a nutrient that helps to balance out the sodium in the body. Your 12-Week Daily Video Trainer - Tuesday, Week 6: Fruits & Vegetables! On the exercise side of the equation, now is the time to really start resistance training. This is what is going to promote the development of lean body mass and help make up for any lean tissue you might have lost already. Resistance training is also going to help strengthen the bones and increase your ability to perform usual activities throughout the day easier. Keep in mind you don&apos;t have to be on an incredibly intensive weight lifting program five days a week to see results - 3 days of training, one or two exercises for each body part can be more than enough to start showing increases in strength as well as body composition benefits. Finally, you should really focus on finding a form of cardio activity that you enjoy. Don&apos;t force yourself to do something that you hate as chances are you&apos;ll just stop doing it. You may want to look into the types of cardio that are less stressful on your joints such as swimming, using the elliptical trainer, or joining a kickboxing class that doesn&apos;t have much impact. If you&apos;re suffering from knee, back, or other joint pain, this is going to be a very smart move to ensure that you&apos;re able to continue being active for the years ahead. [ Click here to learn more. ] Promote Comfortable Joint Movement After A Grueling Workout. As any true bodybuilder knows, the body endures a serious beating to reach that level of performance - the standards of excellence - and sore joints are part of the price that&apos;s paid. See what glucosamine and other products can promote right here. So, keep these points in mind. It is never to late to start making improvements in your diet, lose the body fat that has found its way onto your body over the years, and start feeling better about yourself. Staying active is the single biggest influence on your maintaining good health in your later years.